These are the Terms and Conditions of our ZWebMedia Affiliate Program (ZAP). Please read them carefully. We appreciate your interest in our affiliate program! ZWebMedia Affiliate Program (ZAP) is a free, two tier standard program, plus a Super Affiliate incentive, and open to all. Registration for ZWebMedia Affiliate Program is easy, online, and open to all. Just fill out the registration form and you are approved! Affiliate standard commission is currently 7%, permanently stored in the database (never expires). Parent/sponsoring affiliate commission is additional 3%. Super affiliates commission is the standard commissions plus 1% of all downlines (max 10 levels). Registration for Super Affiliates are by application only. Customers get 10% recurring (forever) discount for using affiliate codes to register. Affiliates can use their own code to purchase, and thereby receive a total discount of 17% (10% discount plus 7% affiliate commission). Affiliate/customer relationships are stored in the database and never expire. Affiliate commission payout is 2x per month, 1st and 15th, Thailand time. Affiliate commission payout is by PayPal and in US$ only at this time. Minimum balance for payout is $50. Account balances below this level will be held until next payout. AFFILIATES MAY NOT PUBLICLY POST AFFILIATE LINKS ON ANY PUBLIC FORUMS. AFFILIATES MAY NOT CLAIM ANY RELATION WITH, OR ENDORSEMENT FROM, any external websites, companies, or organizations. Negative campaigns (words like "Scam", "Exposed", "Don't Buy", etc.) damage the credibility of ZAP and are not allowed. Affiliates must know their customer, and be assured of the customer's knowledge of this product. Affilate commissions are not affected by customer claims under ZWebmedia Absolute 100% guarantees. Affiliate commissions will be deducted for orders with refund claims. (Typically this number is very low). Affiliates abusing the system will be terminated and banned. We have no intention of cheating affilates out of even one penny of their commissions, but mistakes can and do happen. Please remain calm while we work through the issue thanks. Local Thai product sales not included in ZAP. We consider our affiliate data critically important, and our site is configured to do automatic daily backups, and weekly offsite backups. Affiliate Terms and Conditions are subject to change. Any news or changes will be sent to the newsletter. You must have "Receive Newsletter" set to "Yes" to receive it. ZWebMedia reserves the right to change the commission percentages at it's sole discretion. ZWebMedia reserves the right to offer other incentives and performance bonuses on an individual basis at it's sole discretion. ZWebMedia will need to modify or end this affiliate program upon any change in regulations resulting in our inability to deliver our products. Any taxes are the responsibility of the affiliate. If we look at one of the more popular affiliate programs (Azon), they offer commissions of 4% - 8%, it is only one level, and their tracking cookie expires in only 24 hours. Any further sales are not credited to you. ZWebMedia Affiliate Program (ZAP) is light years better than this. Please see "Help Videos" in the blue menu area for better explanation. In this example, your organization has 4 sub-affiliates and 14 customers, 10 customers plus 4 sub-affiliates (because affiliates can also be customers). First, you have 2 direct customers, and you would receive 7% commission on sales to yourself and your 2 direct customers. Affilate #1 would receive commissions of 7% on sales to his 3 customers plus himself. You would receive 3% of those sales. Same for Affiliate #2. Affilate #2 would receive commissions of 7% on sales to his 2 customers plus himself. You would receive 3% of those sales. 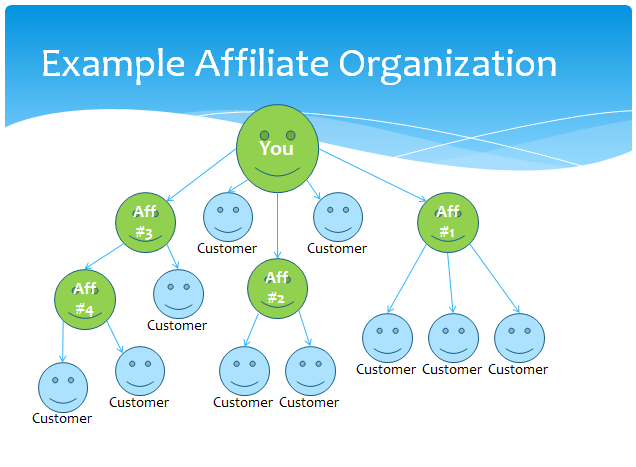 For Affiliate #3, he would receive commissions of 7% for sales to his direct customer plus himself, and 3% of sales of Affiliate #4 and his two customers. You would receive 3% commissions on sales to Affiliate #3 and his direct customer. But you would not receive any commissions from sales of Affiliate #4 and his group, because he is two levels down from yourself. SUMMARY: You will receive commissions from your direct affiliates and their customers. BUT: you won't receive commissions on affilates of your direct affiliates (affiliates who are 2 levels down from you in your organization). EXCEPTION: This is where the SUPER Affiliate classification differs. SUPER Affilates will receive and additional 1% of ALL sales in their organization, even sales further down in the group, up to 10 levels deep. I don't know of any other affiliate program on the planet that offers this. To become a SUPER Affiliate, you should have affiliate commissions of about $100 or more for three straight months, and then contact me about it. SUPER Affiliates detach ("go direct") from their sponsoring affiliates to prevent double (or triple or more) paying of the 1% commissions. We provide an Affiliate Admin login and admin area where you can monitor sales in your group and your downlines. To join ZWebMedia Affiliate Program, first create a customer account HERE. Then, upgrade it to an affiliate account HERE (you will need to login). Customer and Affiliate accounts are tied together and there is no difference in the login. Once logged in, you will select "Customer" or "Affiliate" functions.